Labour won support from the Conservatives to lead a minority administration at North Lanarkshire Council. 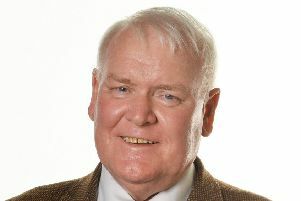 However, council leader Jim Logue, who was also backed by independent Alan Beveridge, is adamant no coalition or deal has been agreed between the two parties. All Labour nominations were passed by 41 votes to 33 over the SNP’s, as Paul Kelly was reappointed as Councillor Logue’s depute, Jean Jones became provost and Tom Castles her depute. Councillor Logue said: “I have not entered into any coaltion or made deals, formal or loose, with any other party in North Lanarkshire. “I have never asked the Conservatives for support, but I realise there are those who will never acknowledge or accept it for political reasons. They will use the expression ‘Red Tories’, but I have nothing in common with the Conservatives for some of the outrageous policies they have introduced. “However, the Conservative group are absolutely entitled to express their view and I just don’t think they wanted anything to do with the SNP. “We don’t know how they will vote in the future, I don’t know what policies they are passionate about because I’ve never had a discussion with them, but I’d hope when it comes to growth they’d be the first to support that. Conservative group leader Meghan Gallacher says her members wanted to participate in the meeting, but warned they may not always back Labour. She said: “Had we abstained the vote would have been tied and cutting cards doesn’t seem the right thing for democracy, as we felt the SNP group are dysfunctional we backed Labour this time. The SNP refused to take up convenerships of the Community Safety and Partnership Governance committee and the Cumbernauld and Kilsyth Local Area Partnership offered to them. The SNP members also refused to join the traditional photograph of the new council as protestors unfurled a giant ‘Red Tories Out!’ banner.